Just before Christmas, the first trailer for the Sundance selected indie drama Kumiko, the Treasure Hunter arrived, just in time for the snow to start hitting the Northern part of the United States, which is perfect for the snowy setting of the film. If you haven't watched the trailer yet, the film follows a young woman from Japan, who watches Joel & Ethan Coen's Fargo on VHS, believing it's a documentary. And this inspires her to head to wintry North Dakota to try and find the buried suitcase full of money from the film. Like all good stories of buried treasure, this is about the journey, not the loot. And now we have a bright, colorful illustrated poster, which contrasts the mostly stark, snowy color palette of the film itself. Look now! 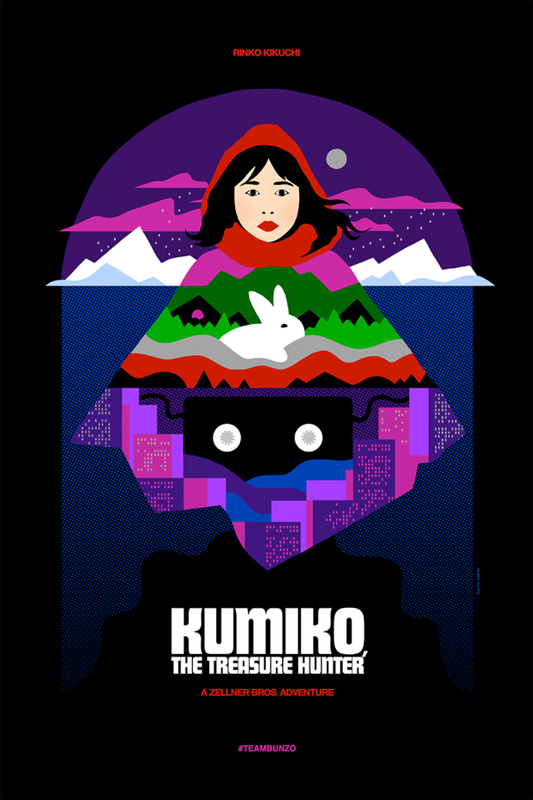 You can watch the first trailer for Kumiko, the Treasure Hunter right here. Dig the poster. Can't wait to check this out. I be crushin' on Kikuchi-san.